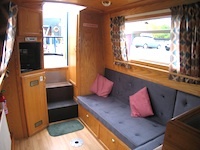 As this is a 6 berth boat, there is a fixed double at the front of the boat, in its own private room. There is also a dinette/double conversion at the rear and two single beds in the centre. This boat sleeps up to 6 people.